When Algiers’ Underside of Power dropped in June 2017, released on the granddad of alterna-labels, Matador, it was not to be ignored by critics. Reviews in Pitchfork, PopMatters, Rolling Stone, The Guardian, Drowned in Sound, AVClub and AllMusic enlisted a scramble of genre mash-ups in the struggle to describe Algiers’ sound: "industrial hymnals, raging against the machine through experimental rock epics"; "an unnerving, tense sonic environment"; "industrial post-punk"; "classic 60s soul with post-punk experimentation"; "a confrontational meet of gospel soul and industrial beats, of Bad Seeds guitars and occasional Prince-esque croon"; "apocalyptic, gospel-industrial howl as a primal scream against systemic racial oppression"; "the juxtaposition of Southern African-American gospel…and Northern Soul." When reading through the reviews, it is impossible not to think of the Kurt Schwitters quote, "This is what is known as perspective, and it is a swindle." Categories don’t make the music, and yet there is a desperate need for us to be able to find the bins in which to put our vinyl. Both Algiers and Schwitters refuse the inclination toward categories, and the idea that set areas are what define the art - whether it be based in audio or imagery. Reviewers get plenty right (and plenty wrong) about Algiers, but the more important take away is, you need to listen. 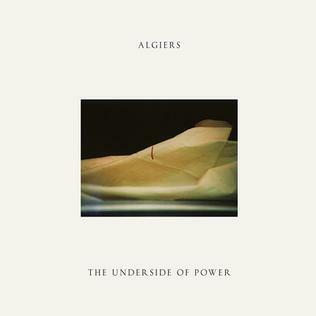 To listen to Algiers you need to be able to handle the ominous, the confrontational, the kinetic, the abstract, the Orwellian, the Devil’s Tritone, and the chaotic when muscled by conviction. The album consists of twelve tracks, written by all four members of the band (Franklin Lee Fisher, Ryan Mahan, Lee Tesche and the recent addition of Matt Tong), each moving across an array of instruments (sure, vocals, bass, drums, guitar - but also synths, sampers saxophone, Glockenspiel and a Wurlitzer or two), and produced by Portishead’s Adrian Utley. And yes, to parrot the reviews, you’ll hear Southern-gothic-industrial that cranks out punk rock with gospel phrasing and speaks to the apocalyptic politic of the deep South and its deep-sixed populations now ubiquitous in America. And yet... the easy comment on the political density of the album overlooks the attendant musicianship and literary depth that are the bones of that flesh. Let’s get to the bones, shall we? The album starts with the bold "Walk Like a Panther," a bomb of a song that starts off by sampling the words of police-murdered Black Panther leader, Fred Hampton, over some of the thickest, decayed distortion you’ll ever come across. With the choice of Hampton’s words, declaiming that "when I leave you remember I said, with the last words on my lips, I am a revolutionary," Algiers forges the album’s intro with a haunting intensity. The composition’s musicality - a walking bass line, frenetic drum programming, some creepy keys - veils not its indictment of corruption amongst the American organized, whether that be that of the establishment or the stars of the resistance. Fisher’s vocals are a mercurial and charismatic holler in the ear of the sleeping. The composition blues-shouts that "we’re gonna break down the breakdown of meaning / This is a final execution / It's our endgame." From there it goes to "Cry of the Martyrs," a synthed-up, guitar-textured battle hymn that hinges on a deft play on the word "Calvary." The refrain echoes: "They'll say our whole life is a locust / Disturbing their fractious peace / But it is they who mangle our horizons / Of our defeat at Calvary." The word "calvary" comes from the Latin name for the mount of Jesus’ crucification, "Calvariæ Locus." In an age where the person occupying the Office of the President makes up words at a disturbing frequency, a good listen of "Cry of the Martyrs" answers such absurdity with an evocation of Fisher’s howl carrying over the scorched landscape at dawn that is Tesche’s guitar and the stampede of resistance that is Mahan’s walking bass line and Tong’s militant drums. The third track is the title track of the album, uptempto and franctic and deceptively dance-able in a Motown way - what Drowned in Sound sees as "disarming, actually, how an album this heavy can be so kinetic, so compulsive, so - the word seems wrong, but funky." Fisher’s phrasing weaves effortlessly through verse, hook, bridge and return while the music takes a dramatic minor to major and back to minor turn. From there it continues on to "Death March," a track that conjures a sort of bad-acid trip Depeche Mode: '80's-like beat drum track, bassy synth bed, spidery guitars, Ennio Morricone backing vocals over a spanish-scaled scaffold that builds into a droney, undulating, cinematic distortion. "Death March" captures the "crypto-fascist contagion" (Fisher, NPR) with a sound intended to remind us the even fascists get the night terrors. If you are aware of the current fascination with zombies as a potent critique of neo-liberalism, "Death March" captures all that is powerful and dreadful about such a trope. "Death March" and the next track "A Murmur. A Sign." have some nice segue symbiosis, especially with the latter’s "dark-wave ambient techno" reminiscent of dystopian, Prophet-5 John Carpenter soundtracks, as described by Mahan (NPR). This chanting, lament of a song could be judged in the crude terms. But with a little more nuanced ear, and maybe a good listening session coupled with some attention into the lyrics, reveals in the song the powerful state of incoherence that is picking yourself up when you are in the simultaneous states of "I can’t go on, I’m lost without it" - the masculine, Hemingway-esque impulse and the costs of such detours. From there, the album engages you with the wistful piano at the outset of "Mme Rieux" - a title that references a serenely courageous character in Albert Camus’ The Plague who posits that with "age, there is nothing much left to fear." The song understands that, as the idea of something that has no actual existence, the trick of abstraction is to render all outside it’s purview as incomprehensible. At the halfway point of the album (! ), you’ll find "Cleveland." With the cadence of Hampton’s Black Panther speech, "Cleveland" considers the innocent brown and black dead in the age of police shootings and actually remains unbowed. The looping "we’re co-MING" that remains constant in the background is straight out of revival gospel that has powered many a social movement. As someone who grew up in the the title city, with its combined reputation of Ohio’s liberal city yet its evident pernicious and retrograde segregation, the song is a revelation. The subsequent track, "Animals," comes fast and yes, has an Industrial, Ministry flavor to it. It’s every bit the witness to what the post-ought era is. It’s dark. Yet musically it doesn’t stop at the clang and bang and grind of industrial but insists on a (yet another) deep bass line that the invokes the subterranean. The next track, "Plague Years," takes us further underground and is by far the most avant garde on the release. With its dominant instrumental bent, non-narrative poetic vocal riffs, and deep set dark grime techno overtones, the composition is less a lulling interlude into oblivion and more an opening into the labyrinth of what Algiers brings to the table musically. Revealed by Mahan as a treatment of two spoken word pieces by Travis from the legendary Chicago experimental outfit Ono, "Plague Years," feels like a composition deliberately left open and free-form, its meaning left to evolve in the mind of the listener. From there, the subterranean labyrinth continues with a bit of a trippy, Pink Floyd turn with "Hymn for an Average Man." This track’s quietude and haunting repetition, with a listen or two, makes it impossible not to read the word ‘average’ in anything but quotes - a weaponized notion of ‘average’ that is leveraged against and wedged between people, an opening fascism fills. The album then concludes with "Bury Me Standing" as an instrumental intro to the final track, "The Cycle / The Spiral: Time to Go Down Slowly." The former, with its echoey cloister chant, Native-American dentillium jangle, and Blade Runner/Vangelis saxophone is both unnerving and heavy but sets into nice relief the latter, with its faster, beat-driven keyboards and the return of vocals. Notably, "The Cycle / The Spiral" has a fantastic 6th to 2nd progression that doesn’t so much resolve as create ever looping, Esher-esque overlay. The album as a whole does hold together and engages multiple lines of flight that speak to the band’s deep and varied musical roots. Even the album art gestures to the solid-state focus of intent: black font on empty white, centered with a Brad Feuerbach photograph depicting a creepy marked-up photograph evoking vellum and blood. And make no mistake: Algiers is not a product of the studio. They take their art on the road hyper regularly and bring every bit of intensity and talent found on the album to the stage, whether it’s with this release or with the music from their self-titled debut album. As Randall Duncan comments, Algiers has "a vision of what they wanted to say about sound. Amongst a lot of modern music, the trend is a bit escapist and electronic and luxurious. This record stands out because it's confrontational, and it takes a stand on politics, and it's not ambiguous or escapist. I think that's something really powerful that needs to happen with music and art right now." With that vision and that sound, Algiers both confronts and reimagines the fragmentary nature of the world. For listeners, this raises a set of questions. Do you have hope? Do you resist? Do you lock-step? Whatever you do, you better listen. Listen to Franklin Lee Fisher’s epic and unbelievable vocal phrasing. Listen to Ryan Mahan’s sustaining basslines and hella-synth drives. Listen to the Venn diagram that is the lyricism and wail of Lee Teshe’s guitar lines. Listen to Matt Tong’s imperative, punctuating percussion. And what you will hear is not the categories, not perspectives, but Algiers.